The Police: Autonomy and Consent is composed of two parts dealing mainly on the theme of police autonomy (Chapters 2-6) and the reciprocal theme of consent (Chapters 7-9). In particular, Chapter 2 is devoted to an historical account of the development of early police autonomy. Chapters 3 and 4 consider the political relation of the successor force within the local state in the mid-1970s, and the historical changes in the relationship between the police institution and the central state, respectively. Subsequent two chapters locate the core problem in considering police independence within the legal domain, and the role and political orientations of the three intrapolice organizations in reinforcing the development of autonomy. Chapter 7 demonstrates that different forms of relationship have historically characterized the relations between police institutions and the different social classes. 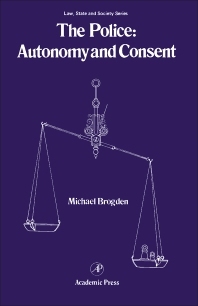 The last two chapters present evidence on consent, and draws the themes of autonomy and consent together by focusing on the role of the chief police officer, positioned at the nexus between structural demands and organizational restraints, in continually negotiating definitions and practices of police work. The Development of Autonomy—The Order to "Proceed against Brothels"
The Police Institution and the Doctrine of "Original Powers"